Whether you come to us for an employee workforce training program, a professional seminar, a social function or a family celebration, the College Lodge is the ideal place for your group. Main Lodge - A beautiful facility that can accommodate up to 150 people. Sleeping Lodge - Modern, dorm-style accommodations for overnight programs with a minimum of 10 guests up to 90. Outdoor Campus - A beautiful setting on over 200 acres of woods and natural surroundings with hiking trails, cross country skiing trails, recreation areas, and more. Catering Services - Full service catering from FSA, for breakfast, lunch, dinner, banquets and more. Workforce Experiential Training - We are a certified facility offering creative, innovative and hands-on approaches for training, team building, education and more. Meetings and Events - We welcome one-day meetings, conferences, social gatherings, family celebrations and other events. 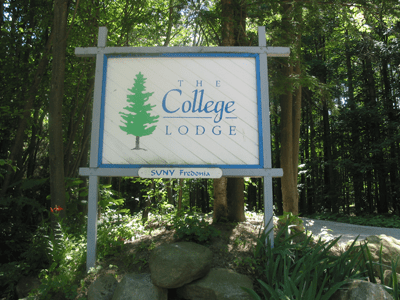 The College Lodge offers dynamic, flexible services to meet your exact needs. We are committed to helping your organization meet its goals with programs that are educational, fun and affordable. To provide a basic framework of education, recreation and resource management consistent with the character and capacity of the lodge’s natural resources.